Karl-Birger Blomdahl: Adagio from "The Wakeful Night"
Volume One, which contained music by Söderman, Stenhammar, Larsson, Peterson-Berger, Alfvén, and Wirén (Naxos 8.553115), was attractive, and now Volume Two has come along, and it is a jewel. I don't know to what extent these are "favorites" – some of the music is relatively rare – but they may become your personal favorites anyway. These are Swedes who composed in the twentieth century. Kurt Atterberg and Ture Rangström were of the generation that was reaching its fullest maturity around the time of World War One, and Lars-Erik Larsson, Gunnar de Frumerie, and Karl-Birger Blomdahl were from the following generation. Most are relatively unfamiliar outside of their homeland, although Atterberg achieved fame in the late 1920s when his Dollar Symphony won an international competition and was played by Sir Thomas Beecham. Some of the music on this CD is in a pastoral vein. Larsson's Lyric Fantasy is pleasingly melancholy, and its gentle introspection reminds me of Vaughan Williams' Pastoral Symphony (Symphony #3). There is beautiful writing for winds in this short fantasy. De Frumerie's Pastoral Suite is in five movements, and the titles (Preludium, Gavott, Saraband, etc.) look back to earlier musical eras. The music doesn't feel particularly antique to me, though. The flute is given prominence, and it is the source of long, consoling melodies in some of the movements and brilliant dance themes in the others. Not just pastoral, this suite leaves one feeling profoundly at peace. Larsson's Little Serenade is neo-classical, and its circular structure – the same material appears in the first and last movements – ties it together neatly. These outer movements are witty, but the internal ones are either passionate or governed by a more earthy sense of humor. The Adagio, the last of the three pieces on this CD by Larsson, is altogether different. Its anguished harmonies and tangled melodic lines are almost too much for its brevity. Atterberg's Suite started as incidental music to Maeterlinck's mystery play Sister Beatrice, a drama that also inspired conductor Dimitri Mitropoulos early in his career. This is emotionally intense music, filled with a morbid yearning that suits the drama's subject. (A nun is torn between earthly and spiritual love.) The dark waltz that closes the suite is not dissimilar to Sibelius's Valse triste. The Divertimento elegiaco by Rangström reminded me, at times, of music by Bernard Herrmann, particularly of the less violent moments of his score to "Psycho." It's highly melodic, but dark and very serious. Another dark work is the last to be mentioned here: Blomdahl's Adagio from "The Wakeful Night," a drama about witch hunts. It is simple and elegiac, and gives few hints of the composer's later paths, which were definitely more modernistic. These are excellent performances. 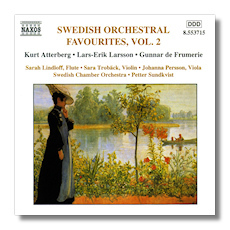 The Swedish Chamber Orchestra, based in the small city of Örebro, has won awards for its earlier Naxos recordings, and they play these works stylishly and with commitment. The soloists are outstanding, not just for their understanding interpretations, but also for their characterful playing. The engineering is fine – the bass is a little too full – and the booklet notes are helpful. Try this!